Well here it is folks. 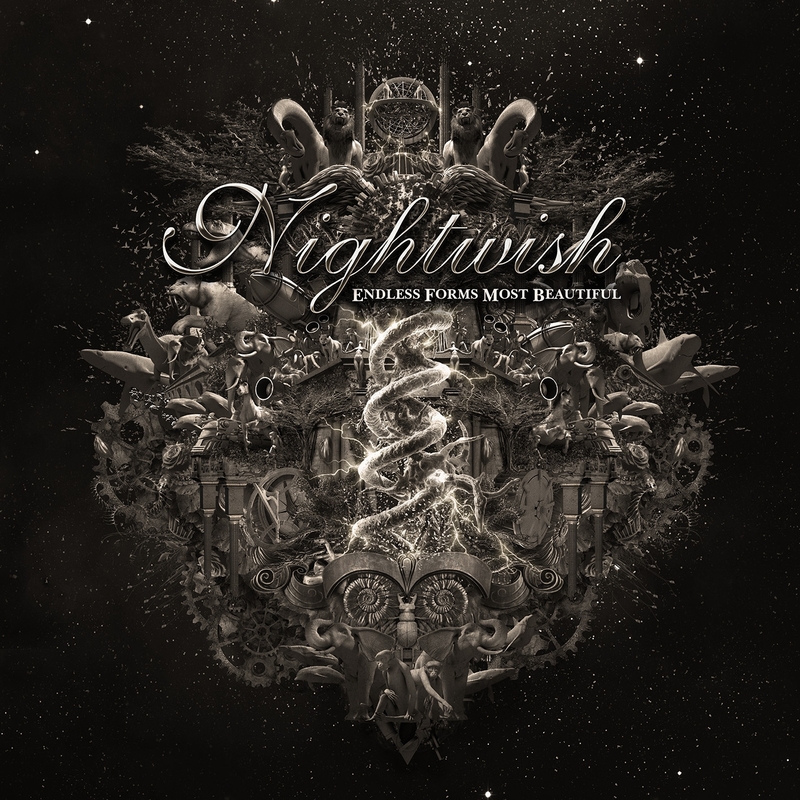 Probably one of the most anticipated releases of the year is upon us, Nightwish’s ‘Endless Forms Most Beautiful’. As always a Nightwish release is met with great excitement within the metal community but this release is also being met with even more expectation and wonder as it is also the debut of new singer, Floor Jansen to the bands studio recordings. Also the album’s theme takes a bit of a departure from previous Nightwish works as it deals with subject matter of Darwinism and the greater workings of the cosmos. I know this has caused some concern among fans as they feel Nightwish should steer away from subjects regarding science or evolution and focus more on the subjects that revolve around fantasy or gothic nature. However upon listening to ‘Endless Forms Most Beautiful’ I found no problem whatsoever with what I was listening to as the music in the album is put together in a truly beautiful and metal way. A way only Nightwish can seem to do and so many others try to mimic but fall so so short. So for those of you concerned about the subject matter, don’t be, because upon listening to the album you will become instantly enchanted with many of the songs here. out by the band. What is important to note here, is while the music itself overall is more heavier and aggressive Floor’s vocals provides a very interesting contrast to this. Floor’s vocals on the album are soft, subtle, gentle and very warm while also being aggressive where they need to be. I guess you could compare this to the theme of the album. While the music can serve as the dark and cold Cosmos, Floor’s vocals represent the spark of life that ignited our human consciousness out of the dark void. I was truly amazed by Floor’s performance on this album and while I know she has the ability to sing the operatic parts of older songs, (I have seen her perform them live) I think the band purposefully wrote the songs to not include that style of vocals for this release. In fact, if I am honest, I think operatic vocals with these songs would have ruined them. For those wanting to do a singer comparison of Floor/Olzon/Turunen here it is. Tarja can flutter the operatic vocals all day long, that was her style and it is a good style. Olzon, had a more sharper hard edge to her voice that lent well to certain types of songs written for a more rock edge with a bite. Jansen’s vocals seem to be the perfect balance in between the two while she also has the talent to do either one when called upon to do it. The difference is I think Floor’s voice offers a certain kind of warmth that other two singers did not bring to the table for Nightwish. That’s called diversity folks. The individual songs on the album are all truly great in some way with maybe an exception here or there, there tends to be parts with sound effects or something I could have done without. But maybe that is just me. Tracks of note are the title track, ‘Endless Forms Most Beautiful’ which I think is a great fast paced rocker that should be great live, ‘Yours is an Empty Hope’ which showcases both Floor’s vocals and Marco’s and then there is the final track ‘The Greatest Show on Earth’ that clocks in at a massive 23 minutes. I call this Nightwish’s ‘Rime of the Ancient Mariner’. The song has narration, sound effects and weaves a huge tale. Maybe a bit overdone but still a pretty good track. So, what do I think of ‘Endless Forms Most Beautiful’? I think you should go out and buy this fucker. That is what I think. The sound is huge, robust, full of life, mystery and wonder. It is Nightwish in every form while also Nightwish in a new form…a most beautiful one. You should mension that Floor does actualy pure growling atleast in the chorus of Yours Is an Empty Hope 😀 I saw a live clip from the start-up of their US tour and that part sounds amazing!